Motherhood negatively affects female employment in majority populations across Europe. Although employment levels are particularly low among women of migrant origin, little is known about the motherhood–employment link in migrant populations. 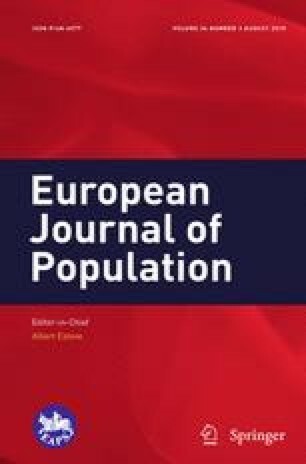 This paper investigates whether family formation differentially affects the labour market position of migrant women and their descendants compared to natives. Using longitudinal microdata from the Belgian social security registers, 12,167 women are followed from 12 months before until 48 months after the birth of their first child for the period 1999–2010. Levels of activity (versus inactivity), employment (versus unemployment) and full-time employment (versus part-time employment) are compared between natives and first- and second-generation women of Southern European, Eastern European, Turkish and Moroccan origin. We find that activity and employment levels decrease to a larger extent following the transition to parenthood among women of migrant origin than among natives. With respect to activity levels, differences between second-generation women and natives are largely explained by socio-demographic and pre-birth job characteristics, while differences between first-generation women and natives are not, suggesting that other factors such as tied migration patterns determine labour market attachment among first-generation mothers. With respect to employment levels, unemployment is increasing more among women of migrant origin of both generations than among natives, also when controlling for background characteristics, which signals differential access to stable job positions as well as to family policies. In sum, the results draw attention to the challenge that parenthood creates for mothers of migrant origin in terms of retaining and gaining employment, but also to the role of labour market entry and early career positions. The online version of this article (doi: 10.1007/s10680-017-9431-7) contains supplementary material, which is available to authorized users. This research was supported by grants from the Research Council of the University of Antwerp (BOF-DOCPRO2013) and the Flemish Research Council (G032715N).